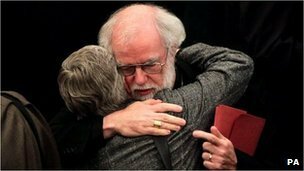 This entry was posted in Anglican Churches, Gender and Leadership, Rowan Williams (Canterbury) by Peter Kirk. Bookmark the permalink. I see some of my readers today have found my 2007 post Bishops without borders, including women. 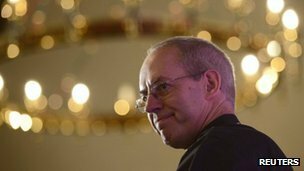 Rereading my own post reminds me that Sam’s proposal is in effect the same as many opponents of women bishops were calling for in 2007: a separate province. Maybe if the proposal is presented as such it will find supporters on both sides of the argument. So what has Ezra got to do with women Bishops? Agree with you Peter that separate provinces are probably needed. Iconoclast, I spammed the comment about Ezra, as completely off topic. All of Western Protestantism is faced with its impending secularization. They are however a state church, which aside from majority convictions, is a political arena that must follow governmental legislation. Still pop-culture should be excluded. Thank you, Wesley. Yes, secularization is a major challenge for churches, to which they have responded in various ways. And being a state church complicates things for the C of E. But Paul commended adapting to the culture, being “all things to all men”. So why exclude adapting to pop culture? Because popular culture is a trap, of course. Jesus prayed “My prayer is not that you take them out of the world but that you protect them from the evil one.” (John 17:15, NIV) But you, Wesley, seem to be trying to frustrate Jesus’ prayer by recommending Christians to withdraw from the world and its culture, rather than living within it under the Father’s protection from the evil one. You are an Emergent. I reject you in Christ’s name. Wesley, do you reject me, or do you reject the words of Jesus which I quoted to you, and the ones of Paul which I alluded to in an earlier comment? I will overlook you rejecting me, but will Jesus overlook you rejecting his word? The postmodern seek to play a game of naivety; as if Christ was a fool. What you do not want to come to terms with is yourselves; in that the West popularly and consciously reject Christ and The Church. Are you in The World? I will not reply any further.